I am delighted to have Trent Jamieson at The Qwillery today. 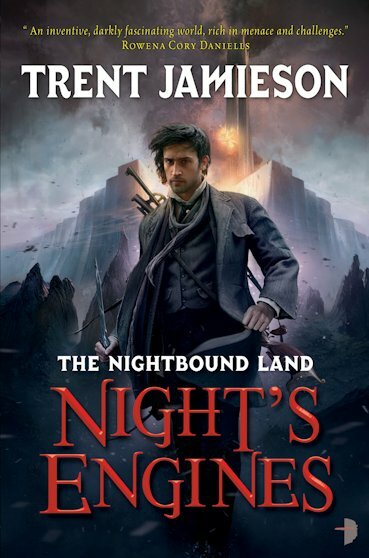 Night's Engines, the second novel in Trent's duology The Nightbound Land, will be published on May 29th in the US and Canada. Trent: I can write just about anywhere, I've written stories on the bus to work, scrawled them down in bed, about the only place I don't write is in the shower - though I do get some of my best ideas there. Trent: I'm a bit of both, I like to have a rough idea where I'm going, but I don't map out scenes. I love those moments where the story is flowing through my fingers, moving along as if by itself. It might mean that I take longer working through the writing of a story the what's and the who's and the why's, but I don't know if I could keep at this if I didn't have those wonderful and addictive moments of pure creativity and serendipity. Trent: Sitting down and staying focused. Maybe if I planned more, eh? TQ: What inspired you to write The Nightbound Land Duology? Trent: A whole host of things, a summer in Brisbane where it never stopped raining, a dark wall of smoke that I saw as a child that was caused by a bushfire hundreds of miles away, the odd issues that our culture seems to have with refugees, and my love of Michael Moorcook's more frenzied fantasies, and a illness that someone I loved was going through. Oh, and the idea of Terra Nullis - you can look that up if you want to, I don't want to spoil anything. Trent: I flew in a hot air balloon. I dipped in and out of more textbooks than I'd care to remember, I found bits of architecture that I adored. Lots of things, but none of it was particularly rigorous. I really wanted Shale to be kind of nebulous, almost like the Roil that threatens it. TQ: I've seen The Nighbound Land novels described as Fantasy or Science Fiction. Which are they? Trent: I've seen them described as fantasy, science fiction, horror and science fantasy. There's elements of all those things in them. There's a bit of a questish narrative in the second book, there's monsters, sentient machines, and zombie-like creatures. I don't quite know where it fits, but I like that. I like a book with rough edges. TQ: Describe Night's Engines (The Nighbound Land 2) in 140 characters or less. Trent: Roil was about a world ending & people running for their lives. Night's Engines is when people stop running & start doing something about it. TQ: Tell us something about Night's Engines that is not in the book description. Trent: There's some great scenes in this book. David and Margaret really get a chance to fight back. And a lot of secrets are revealed. TQ: In Night's Engines, who was the easiest character to write and why? Hardest and why? Trent: I think David was the easiest to write. I do have this tendency to write bleak kinda horrible male characters, and he continued that trend. But I like to think he changed. Trent: Margaret was hardest, because she is so hard, so uncompromising. I think her journey was the most challenging to explore in the book. TQ: Without giving anything away, what is/are your favorite scene(s) in Night's Engines? Trent: Anything with the Old Men. And the approach to Tearwin Meet was a lot of fun, I still dream about that place. I think the cover catches it nicely, with the tower and the walls. What you don't see is the Northern Ocean just beyond it, I close my eyes and I can hear the waves crashing against the city's walls. TQ: Which character from The Nightbound Land novels has surprised you the most? Trent: This book didn't surprise me as much as the first, they were all rather well behaved. I had a very clear idea of how I wanted this story to end, and I think, in the main, we (me and the characters) all agreed. By about a third of the way through any book I've written I have a pretty clear idea how I want it to finish, this book was even clearer (I've had the ending for nearly ten years) things seemed to move pretty smoothly for me - which might mean I'm getting a little better at this writing thing. Trent: I've a whole bunch of projects that are starting to build momentum. It took a while after finishing Night's Engines, I think I needed to refill the well. I've an urban fantasy series I'd like to write all about family, debt and demons, with a weird sort of mythology that I haven't seen used before. There's a murder mystery set in a world that is sort of like ours but not with a really awful killer at its heart - and a secret society of musicians. I've an epic fantasy novel that I've been sitting on for a few years, just because I didn't feel skilled enough to give it its due - the draft I have is pretty rough, but it has a few scenes that I think are some of my best writing. There's some kid's books. And a novel that is set in rural Australia about love and alternate worlds filled with odd Dickensian characters. Too many things are bubbling around in my head: I need to get back on my bum and start finishing them. I turn forty this year, without wanting to sound melodramatic (but hey, I'm a guy who writes about Death), I'm starting to get a sense that if I don't write furiously I'm going to run out of time. Better to have too many ideas, than none, I guess. With the land in turmoil, it’s up to a decadent wastrel, a four thousand year-old man, and a young woman intent on revenge to try to save their city – and the world. 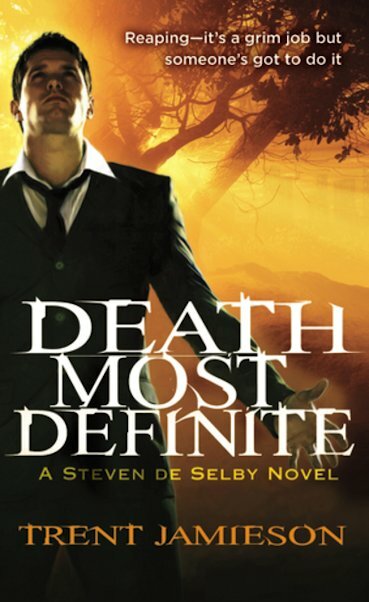 Steven is no stranger to death - Mr. D's his boss after all - but when a dead girl saves him from sharing her fate, he finds himself on the wrong end of the barrel. 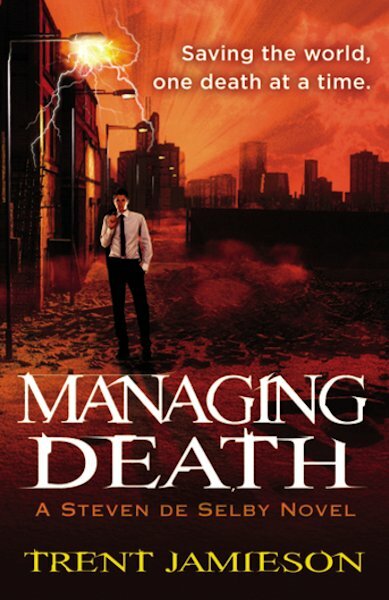 His job is to guide the restless dead to the underworld but now his clients are his own colleagues, friends, and family. Mr. D's gone missing and with no one in charge, the dead start to rise, the living are hunted, and the whole city teeters on the brink of a regional apocalypse - unless Steven can shake his hangover, not fall for the dead girl, and find out what happened to his boss - that is, Death himself. 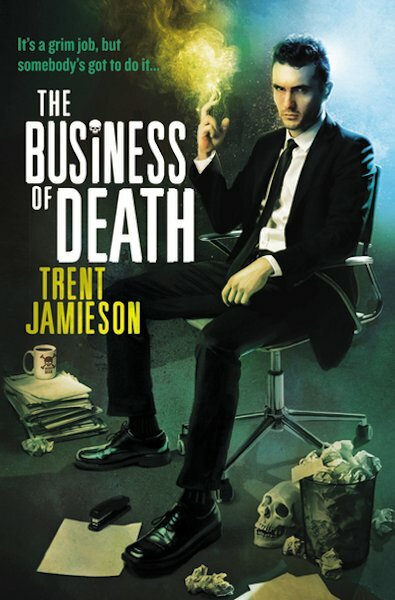 THE BUSINESS OF DEATH includes the first two volumes of the Death Works trilogy, Death Most Definite and Managing Death, as well as the third volume. 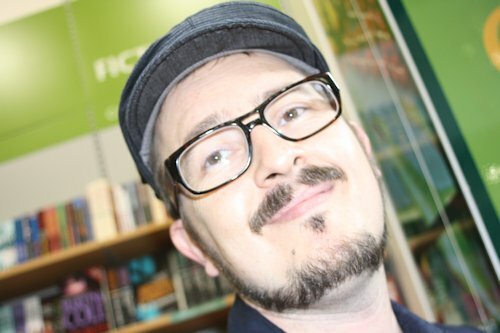 Trent Jamieson is a multiple Aurealis Award winner for short fiction, he has taught short story writing at the Qld University of Technology, and Clarion South. His Death Works Trilogy is available from Orbit books. 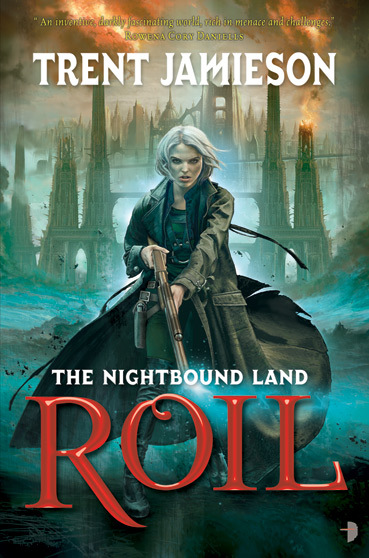 Roil, and Night's Engines the two book of the Nightbound Land Duology are available from Angry Robot. What: One commenter will win her/his choice of Roil or Night's Engines from The Qwillery. What is the most recent Fantasy (Epic, High, Urban, etc.) book you've read? Who and When: The contest is open to all humans on the planet earth with a mailing address. Contest ends at 11:59pm US Eastern Time on Thrusday, May 24, 2012. Void where prohibited by law. No purchase necessary. You must be 18 years old or older to enter. I recently finished reading Royal Street by Suzanne Johnson and The Cloud Roads by Martha Wells. Now I'm reading By the Blood of Heroes by Joseph Nassise. Thanks for fun interview and giveaway! [+1] GFC follower. GFC name is Cherry. I just finished Fair Game by Patricia Briggs. The last fantasy book I read was The Gryphon Highlord by Connie Ward. I'm not sure what it's designation is, but it's definitely fantasy. I've also enjoyed Jenn Bennett's Kindling the Moon and Summoning the Night recently. I can't remember what the last one was but I did read The Gryphone Highlord. thanks for the giveaway and the interview. Well I only read this genre for now so it's not difficult, the last one was Shaded Vision by Yasmine Galenorn. I read FAIR GAME by Patricia Briggs not long ago. This week I finished Summer Knight by Jim Butcher. It's book 4 of the Dresden Files series. I love Fair Game by Patricia Briggs. Just got done with God Save the Queen by Kate Locke. It's a glorious fusion of steampunk, urban fantasy and paranormal romance. Great interview! I challenge Trent to write in the shower. Fantasy I'm currently reading is The Ghost of Ping-Ling by Peter Cooper. Absolutely brilliant! The last and my very first fantasy novel I read was Hailey Edwards' A Hint of Frost which I enjoyed a lot!